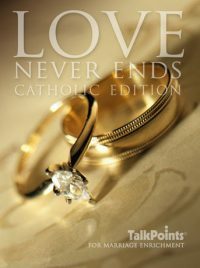 Love Never Ends guides married couples of all ages on a conversation journey that includes ten of the topics of marriage, including: Refreshing Our Marriage, Our Parents, Our Love Life, Leisure and Work, Faith, Children, Money, Doing My Part, Issues, Our Wedding Anniversary. The communication process is especially helpful in gently guiding married couples in a productive, non-threatening, relaxed way of talking. Use Love Never Ends as a counseling tool with a single couple who desires the refreshment of better communication, or use with groups of two or more for marriage enrichment seminars and conferences. 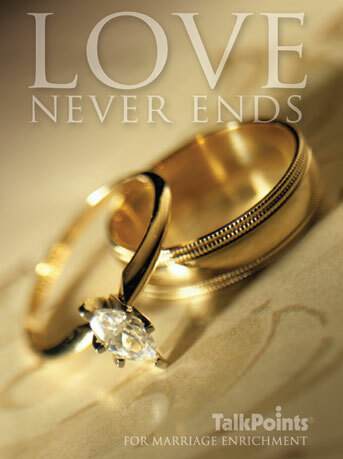 Many chapters of Worldwide Marriage Encounter are now using Love Never Ends with large gatherings of couples.To link to the website where you will find guidelines for using this resource with groups of couples, click here.